Dell PowerEdge T610, R710 870W RPS Power Supply Unit PSU YFG1C 0YFG1C N870P-S0. Condition is Used. Dispatched with Royal Mail 2nd Class. Dual X5675 Hex/Six Core Xeon CPU's. Dell Poweredge T610 Tower Server. 8 x 1TB DELL 3.5" SAS Drives. B Grade Case - it will have scratches and possibly very minor dents as per the photos. Fully Tested. Dell Poweredge T610. Dell PowerEdge T610. We are able to source hard to find parts for Legacy systems through to the latest new in box parts for the latest generations of servers & storage systems. Test and passed Dell diagnostics. Dual X5660 Hex/Six Core Xeon 2.80 GHz CPU's. Dell Poweredge T610 Tower Server. 4 x 450GB DELL 3.5" SAS Drives. 4 x Empty Hot Swap Drive Bays. B Grade Case - it will have scratches and dents as per the photos. DELL PowerEdge T610 Tower Server. Storage: 2x 2TB 7.2K RPM SAS Drive. Backplane: 1x 8 Bay 3.5” LFF SATA /SAS /SSD. 146GB 2.5" 10K Hotplug SAS Drive £12.50. 146GB 2.5" 10K Hotplug SAS Drive £24.50. 300GB 2.5" 10K Hotplug SAS Drive £39.50. Dell PowerEdge T610 server. Two Quad Intel cpu, 48GB Ram, H700 Raid. SAS drives. 2 x 1TB SAS disks, 2 x 1.5TB SATA disks, 2 x 0.5TB SATA disks. 2 x 1TB SAS drives (WD100FYYG). 1 x 8 Bay 3.5”SAS / SATA. Note that this is the higher spec version. 2 x Quad core CPUs. The server takes up 5U in a server cabinet. 2 cpu e5649. RAM H700 512mb cache and BBU. dual hex core 2.53GHz total 12 core 24 threads. We will resolve the problem directly with you. Item Title. DELL PowerEdge T610 Tower Server. Storage: 2x 3TB 7.2K RPM SAS Drive. Backplane: 1x 8 Bay 3.5” LFF SATA /SAS /SSD. 146GB 2.5" 10K Hotplug SAS Drive £12.50. 146GB 2.5" 10K Hotplug SAS Drive £24.50. 300GB 2.5" 10K Hotplug SAS Drive £39.50. 1x T610 - Dell PowerEdge T610 1x Heatsink 8LFF DVD Hot-Plug Tower Server Chassis. 2x Dell Power Supplies. 1x DVD Drive. 6x 500658-B21 - Dell 4GB (1x4GB) Dual Rank x4 PC3-10600 (DDR3-1333). Hard Drives. 8TB Storage ( 8 x DELL 1TB 7.2K SAS Drives). Dual L5520 Quad Core Xeon CPU's. Dell Poweredge T610 Rackmount Server. made with love by. Add to Favourites. Fully Tested. 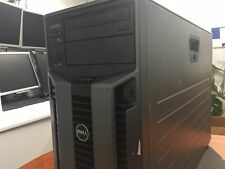 Dell T610 Tower -2x 6 Core X5660@2.8GHz 36GB DDR3 ECC RAM 2x300GB SAS drives in RAID1 6x2TB SAS drives in RAID5 PERC 6/i RAID controller with cache and battery Tower server, working and tested for several hours. Windows server 2016 standard has been installed and activated. Product key for windows server 2016 is included! There is currently 2 working power supplies Upgrade to 64GB RAM will cost £100 extra. the case of the unit has signs of usage with scratches and marks. This doesn't affect the unit's operations. Please let me know if you need a different configuration. Other configurations and many other same/different servers are available, check my eBay items or send me a message. 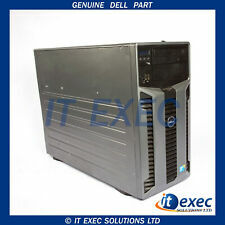 Dell PowerEdge T610 dual Six-CORE XEON X5670 48GB RAM. We will resolve the problem directly with you. 2x146GB SAS drives in RAID1 - windows drive. 48GB DDR3 ECC RAM. Dell T610 Tower. Tower server, working and tested for several hours. Product key for windows server 2016 is included! see picture. Storage: 8x 3TB 7.2K RPM SAS Drive (24TB RAW SAS Storage) . DELL PowerEdge T610 Tower Server. Server Options / upgrades . 2 x CPU Sockets, ONE CPU installed, ( 12 CPU Cores/ 24 Logical Processors). Dell Poweredge T610. DELL Poweredge Servers. Dell Poweredge 2850. Dell Poweredge 1950. Dell Poweredge 2900. Dell Poweredge 2950. Dell Poweredge R200. Dell Poweredge R410. 6X 3TB 7.2K RPM SAS (18TB RAW SAS Storage) . DELL PowerEdge T610 Tower Server. Storage: 2x 300GB 15K SAS (RAID-1) for OS . Backplane: 1x 8 Bay 3.5” LFF SATA /SAS /SSD. Tested with VMWARE ESXI. 6.5 /6.7 / Windows server 2012 / 2016 / 2019. 3X 3TB 7.2K 3.5" LFF RPM SAS (9TB RAW SAS Storage) . DELL PowerEdge T610 Tower Server. Backplane: 1x 8 Bay 3.5” LFF SATA /SAS /SSD. Storage: 2x DELL120GB 2.5" SFF SSD (RAID-1) for OS . Tested with VMWARE ESXI. 6.5 /6.7 / Windows server 2012 / 2016 / 2019.